Rossville and Wilzetta are two tiny towns that once existed in Lincoln County but now only exist in the memories of a few and in two histories recorded by Rev. Hobart Ragland. He served as minister of the Chandler Methodist Church in the 1940s and 1950s and spent many hours researching, gathering and writing about the history of Lincoln County. Much of the research he collected, which includes oral histories, maps and other materials, were donated to the Oklahoma Historical Society in 1980. Earlier, the OHS had commissioned him to produce a historical survey about the state. He wrote some articles for The Chronicles of Oklahoma including one called “Some Firsts in Lincoln County,” published in 1951. Several typewritten oral histories of people he interviewed in Lincoln County are in his collection and include two he recorded about Rossville and Wilzetta. Because actual recordings of the interviews don’t exist, we cannot be sure how much of these memories are the true words of those interviewed but we believe they are worthy of sharing with readers. Rossville was once located at the intersection of two rural roads six miles straight south of Warwick. Today the north-south road is U. S. 177 (County Road 3370) and the east-west road is County Road 980. The Rossville entry in the Lincoln County history book published in 1988 and written by Opal Moulin Frost said it was named for a man named Ross who built a store there. Wikipedia says it was named for Ross Thomas, a local resident. George Shirk’s book on Oklahoma place names says its post office was there from 1895-1907. Possibly the first merchant at Rossville was a Mr.Hutchins. His store was a general merchandise establishment and was located on the south side of the section line in the NW/4 of Section 21-13-3. 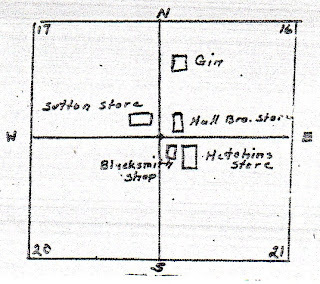 Jake Thomas had a blacksmith shop in the northwest corner of the same section and just west of the Hutchins store. Later, Charles Tabor got possession of the Hutchins store. 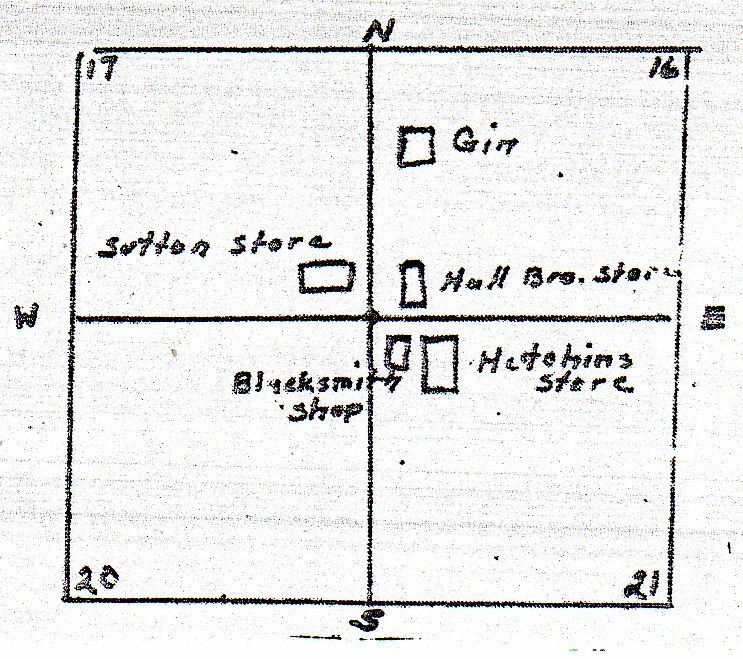 At a very early date a man by the name of Graham Hall, who had gotten possession of some money as a result of the loss of a leg, in in partnership with his brother, Duncan Hall, built another store north of the Hutchins store in the SW/4 of Section 16-13-3. The post office was also in this store. The Hall boys did not remain in business long. They dissolved partnership, and Graham put in a store in Midlothian, and Duncan went West, where he also established a mercantile establishment. Just south of the Hall Brothers’ store and in the same location was a cotton gin which was kept busy ginning cotton for the farmers at this early date. Mr. Tabor built a new store in the SE corner of Section 17 across the road west from the Hall store. It was a two-story frame structure, of which the upper part was used as a dwelling. In 1901 Mr. Tabor sold the mercantile establishment to A. Sutton, who kept it less than a year, when it was purchased by Jim Tolbert, who later sold his business to a man named Rhodes. He in turn sold it to a Mr. Malene, whose son-in-law operated the establishment. The old frame structure was replaced by the current brick building, which is still standing but not in use. surrounding the village’s main corner, which today is still known as Rossville on U.S. 177 six miles south of Warwick. At the time this map was published, the post office was located in the southeast corner of the J. P. Farrell farm in a store built by C. E. Tabor. The names of landowners are shown. 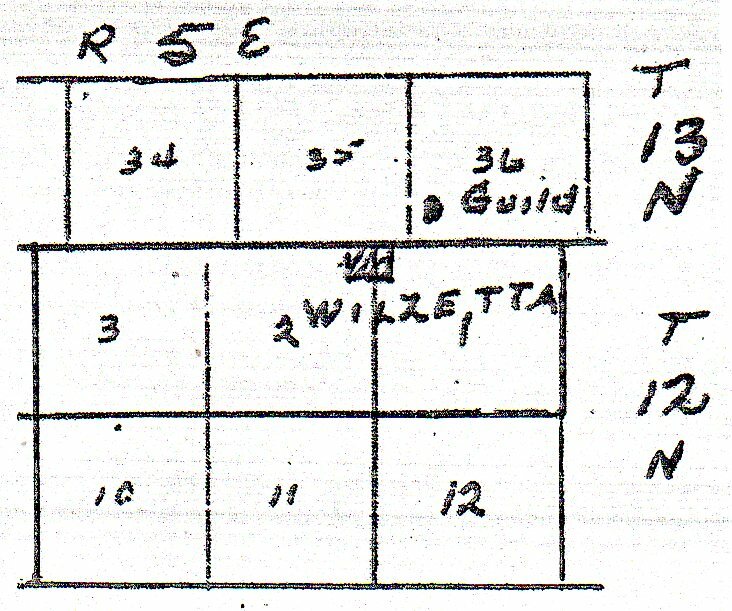 Wilzetta, Lincoln County, last laid out on the farm of Mr. and Mrs. Wm. Johnson at the time of the building of the Fort smith & Western Railroad. It was surveyed by O. H. Hill of Sparks, and named for Mr. Johnson and his wife, Will and Zetta Johnson. Daniel Kinsey built the first store in the town--a general merchandise establishment. He was also the first postmaster. Besides this store there was a cotton gin and a blacksmith shop. Mr. Johnson had a new mill. There was also an artesian well on his place. 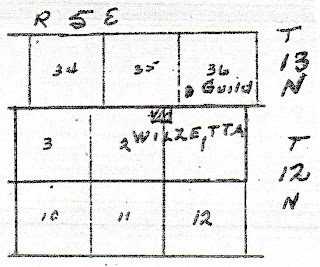 Prior to the building of the railroad there was a little post office in the section just north of the township line which was the northern boundary of the Wilzetta townsite. Mr. Guild, who lived a mile south of Wilzetta, made the application for an office and proposed to call it Guild. He was unable to make bond and the office was not commissioned. The Hunter brothers, however, made application for the office and retained the name of Guild. Mail to the office was brought from the Sac and Fox Agency three times a week. The Guild Post Office, named for Lee Guild, was established in this neighborhood Dec. 14, 1896, five years after this area of the Sac and Fox Indian Reservation was opened for settlement in Sept. 1891. The name was changed to Wilzetta July 2, 1904, as the new townsite of Wilzetta was being developed on the newly-opened Fort Smith & Western Railway. It was closed June 30, 1909. It was named for William and Emma Johnson who owned the land where the west part of the townsite was platted and where the depot was located. Wilzetta (Guild) was located in the old rural school District 92, which was known locally as Oak Grove. Daniel Kinsey, Wilzetta storekeeper and postmaster, was related to James M. Kinsey, a storekeeper and postmaster in Davenport in the 189s and 1900s. Frank Thompson’s family lived across the road east from the Johnson farm and part of the townsite was platted on their farm, so he had first hand knowledge of the town’s history. Rossville Post office was established Oct. 7, 1895, just five months after this area of the Kickapoo Indian Reservation was opened for settlement in May, 1895. It is named for Ross Thomas, one of the early settlers in the community. It was discontinued Feb. 15, 1907. 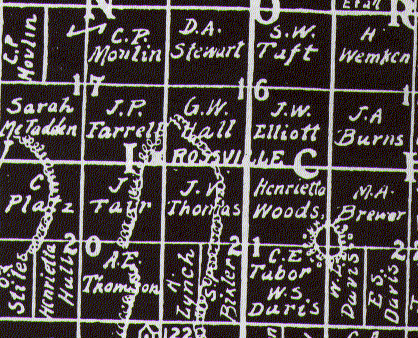 Rossville was located in the old rural school District 122, which was known as Rossville. Abb Sutton’s family and other relatives lived in the Rossville community when the village was thriving. Daniel Kinsey was my husband's g-g-grandfather. My Great great grandfather was J W Daves. He started the Pleasant Valley Cemetery, also called the Guild cemetery. Most of the Guild family of that time are buried there. J W Daves had won the land in the land run and homesteaded there. He is buried there along with his wife and many of his children, grandchildren and one great grand child my mother Virginia Martin. I love this information. I like to think that my ancestors went to the Wilzetta school house a little more than a mile from their property.